Sploshy and wet but that does mean lots of lovely raindrops. All sparkly. I think I am essentially shallow, as I do like shiny things. Dog was wringing wet, and I love the pattern on her neck and back fur when she is. This is amazingly difficult to photograph. Normally dog will stand when told, but she wanted to be an active part of the photography process. A black and white experiment. I was fossicking about in PONY magazine from 1966 earlier this week, trying to see if the Win-a-Pony competition that Dragon Books ran back then actually had a winner. Yes, it did. It was Barbara Slack, from RAF Topcliffe. Whilst going through the magazines, I came across some more fancy dress, which regular readers will know I have a bit of a thing about. So here, from 1966, are a couple of fine examples. I love the pony as tea table: I love the tree at his nose even more. The exhibit was the Mad Hatter's Tea Party, which I guess you can work out as long as you are not distracted, like me, by what was on the table and how it stayed there. No super glue in those days. And here, because I love the look on Mary's face, is "Mary and Joseph", who came from Wellingborough, our nearest town. I'm not quite sure what Mary is holding there, but she does look as if this costume class is the absolute last place she wants to be. She's riding a jenny - a rare appearance. No FPIs, no HABs, sky monsters, other dogs. Just one tripping incident. And everything being rather blowsy, and dripping wet from the dew. Thank goodness I still haven't got round to buying replacements for my split wellies. Nothing like a cold, wet foot to reassure you that all is right with the world. Misty morning. Scaffolding up on the church tower - an anonymous donor has paid for the clock face to be re-gilded. I am so used to it being a bit on the dull side that it had never occurred to me that re-gilding was an option. I'm looking forward to seeing what it will be like (though there might be a bit of a wait - though the scaffolding went up yesterday, signs of work being done today there are none). Dog, ah, dog. You know you're not allowed inside, don't you? And you know why. I don't know if you, readers, know about the Neverseconds blog - the author grades her school meals, and hair quotient is one of the measures. I think one of the measures of my walks should be FPI - fox poo incidents. FPI=1. A couple of days ago, I mentioned in the comments that dog is not imperturbable. She is perturbable (if that's a word). Lovely sunny mornings are all very well, but they do tend to bring out other things besides dog walkers; things like hot air balloonists. These are dog's absolutely least favourite things in the whole world. Here it is. Long distant, but they don't have to be close. Sheep know the dog's there. Dog has not yet spotted the HAB. Now she has. Lead on at this point - if not, she will bolt. I thought the HAB was probably far enough away not to bring on total hysteria, so we carried on the walk. Dog was brave, and managed to survive by sticking close to my legs. Catching up. It's a learning business, this author stuff. I now find I am a picture researcher. People get paid for doing this sort of stuff, and I can entirely see why. Dog still needs to be walked though, as do I. We went to see if the piglets were out yet. No. Sun! Apologies for those of you in the north who have none. Here is a picture of my shadow. There is no picture of what happened next. One moment I was striding along after the dog, the next I was face down in the wet grass. The camera was sodden, I was a tad damp, and deeply, deeply grateful that my plummet had avoided the very fresh dog poo and the squashed fox poo not that far from my face. Dog was utterly unconcerned by my disappearance. Obviously photographing the floor, she thought. Now upright again and setting off after the distant blonde blob that is the dog. I used to regard travel literature with wariness. 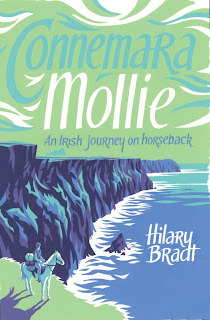 The first I read was Round Ireland in Low Gear by Eric Newby, and was given to me by my husband before we were married. At first I reared away with suspicion from the book, as in those days I only ever read 19th century classics, and Eric Newby certainly wasn’t that. Fortunately for the breadth of my education, if not my mind, I have always been unable to resist the pull of the printed page, no matter what was on it, and I was hooked. Back to the normal walk today, and the snail obsession. Pony books - did men write them?